6 to 7 CDs or 1 DVD. SecuROM 5 DRM. Disc check removed in latest patches. Available for free. See Bonus Maps. Available for free. See Bonus Packs. Available for free. 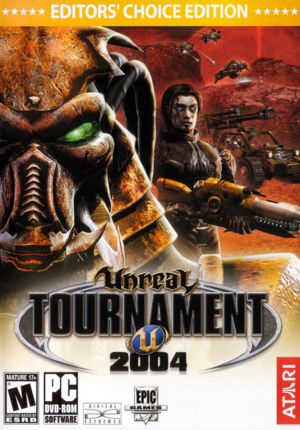 Already included in Unreal Tournament 2004: Editor's Choice Edition and the Mega Pack. Available for free. Already included in the latest patch for OS X. See Bonus Packs. Epic Games has released additional game content for free. UT2004 Mega Pack (Windows) - Contains latest official patch (3369), all of the Editor's Choice Pack's bonus content, as well as 9 new maps. UT2004 Mega Pack (Linux) - Same as the Windows version, but for Linux (32 and 64-bit versions). UT2004 XP Levels - Two new official Onslaught maps, ONS-Ascendancy and ONS-Aridoom. Streamline Bonus Map: AS-Confexia - A vehicle-based Assault map from Streamline Studios. Digital Extremes Bonus Map: CTF-DE-LavaGiant2 - Originally from Unreal Tournament 2003, converted to have full support of Unreal Tournament 2004. Community Bonus Pack 1 - UT2004 Re-Release - UT2004 version of developer-certified fan maps for UT2003. Community Bonus Pack 2: Volume 1 - Developer-approved fan-made maps. Contains 21 new maps, 4 characters, and a mutator. Community Bonus Pack 2: Volume 2 - Second half of the new map pack. Contains 20 new maps, 4 skins and 2 mutators to play with. The Ultimate Ultimate Community Map Pack - All the map packs in the series (Volume 1-4). 44 maps in total. Ultimate Community Map Pack Volume 1 - Contains 14 new maps and a new weapon. Ultimate Community Map Pack Volume 2 - Contains 18 new maps (with one Assault map having 3 weapons and a vehicle exclusive to it). Ultimate Community Map Pack Volume 3 - Contains 6 new maps (most of them are medium-sized). Ultimate Community Map Pack Volume 4 - Contains 6 new maps (most of them are medium/large). The 64-bit build of the game comes with an experimental D3D9 renderer, which offers better performance with modern hardware, but has issues such as broken graphical effects. 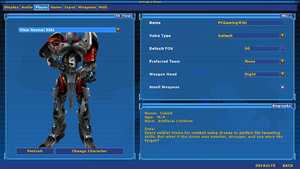 Therefore, it is recommended to use the following unofficial D3D8 to D3D9 wrapper with the 32-bit version of the game, which will display the whole graphical featureset of the game combined with better performance. The game comes with an option to "reduce mouse lag" checked by default, however this option actually functions like a waitstate for the GPU and was put in place to help with input lag in the sub-30 FPS range, which was not uncommon for systems of the time of the game's release. On modern systems this option often cuts FPS in half without any benefits, so it is recommended to disable it. This may also solve some reported Windows 10-specific issues. Find ReduceMouseLag and change each occurrence to ReduceMouseLag=False. libsdl2-dev package is required for Ubuntu/Debian based distro (For other distros you need sdl2 package itself) for compiling. Be sure that the main library is also installed. 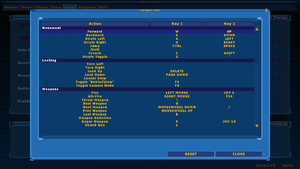 As the Linux version of the game uses SDL 1.2, you can use SDLCL to let the game use features present in SDL2. Once the compiling has been finished move or replace (be sure to make a backup) the existing libSDL-1.2.so.0 file inside System folder. ut2004-win64.ini contains general settings for the 64-bit executable on Windows. 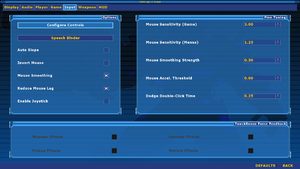 Toggle in settings; see Windowed. See Windowed, then set borderless with Borderless Windowed or similar. No in-game setting, AA can be forced by driver. In online play, the game by default is capped at 90 FPS or so, resulting in severe choppiness. Use "netspeed 15000" (no quotation marks) in console to fix this. 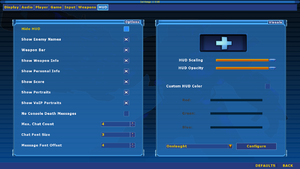 Widescreen resolutions such as 1920x1080 are natively supported by the game but must be set manually. Go to the client section ([WinDrv.WindowsClient] for Windows, [SDLDrv.SDLClient] for Linux). Change FullscreenViewportX= and FullscreenViewportY=YYY to the resolution you want. Start the game and once on the main menu open the console by pressing ~. Type setres widthXheight (e.g. setres 1920x1080). Change DesiredFOV=, DefaultFOV= and FOVAngle= to the FOV you want. Windowed mode can be toggled in-game; do the following to set the default starting mode. Change StartupFullscreen= to the setting you want. Change WindowedViewportX= and WindowedViewportY= to the windowed resolution you want. Go to the renderer you are using ([D3DDrv.D3DRenderDevice] for Direct3D, [OpenGLDrv.OpenGLRenderDevice] for OpenGL). Change LevelOfAnisotropy= to the value you want (2, 4, or 8), or set to 1 to disable. Change UseVSync= to the setting you want. The OpenGL renderer has the property listed twice. Make sure to change both. Can be both disabled and adjusted in Settings -> Input. Mouse sensitivity is affected by the field of view. Therefore it is recommended to use mouse-sensitivity.com to calculate the sensitivity based on the desired field of view. Settings -> Input -> Use Joystick. May require axis mapping via User.ini. Support only DirectInput. Use XInput Plus for Xbox 360 controllers. Menu navigation is only mouse driven. Be sure to have sound quality at 44100 Hz or 48000 Hz for 3D sound to be enabled. Optional: The file alsoftrc.sample in source code contains all the options that can be configured, if you wish, copy the entire content and paste it into alsoftrc.ini (In Linux's case it's .alsoftrc) and configure it to your own pleasure, be sure to remove the comment (# symbol). Sound card is not required if using this guide. Download both Windows binary and the source code from the main page. The German version is censored, but selecting English as language and installing the latest patch restores the gore. Open the console (~) and enter open followed by the IP and port. Go to the Communications tab. This fix only works for users with a Creative SoundBlaster Audigy card or better. From the main menu, go to Settings > Audio. Ensure Audio Mode is set to H/W 3D + EAX. The 32-bit version's default renderer can fail to start due to 'losing' your graphics card. Download and install the 64-bit version of the game. See Enable the OpenGL renderer for instructions. See Windowed for further instructions. 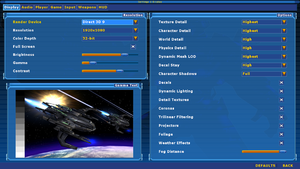 Open RivaTuner (the tool that comes together with MSI Afterburner), add the game file UT2004.exe, and activate or deactivate Custom Direct3D support depending on the global setting. This happens due to the corruption of the .ut2004 folder. Remove it and run the game. On the 64-bit build of this game, hardware audio support appears to have been stripped out entirely, namely the "H/W 3D Audio" and "H/W 3D Audio + EAX" options. Forcing them via .ini ("Use3DSound=True", "UseEAX=True") has no effect either, leaving the 64-bit version with far inferior sound quality and 3D positioning. Moreover, the 64-bit version defaults to a D3D9 renderer, which is exclusive to this version, but has been left in an experimental state by Epic and is functionally incomplete. Graphical issues include the Double Damage pickup shader, missing shadow volumes (e.g. DM-Morpheus3, DM-Gael), missing water puddles and possibly more. However, the D3D9 renderer does appear to perform faster on modern hardware compared to D3D8. As a D3D8 to D3D9 wrapper is available now, it is recommended to use this in place of the stock D3D9 renderer. On Audigy hardware, several maps have broken sound with the "H/W 3D Audio + EAX" option under 32-bit; for instance, on DM-Goliath near sounds appear far away and vice-versa. Killing another player with Link Gun altfire can hardfreeze the game in rare instances. Make the game always start windowed, then switch to fullscreen with Alt+↵ Enter after reaching main menu. Run UT2004 in Compatibility Mode (Windows XP Service Pack 3). 8, 9 Experimental Direct3D 9 support was added via Patch v3204. It was later removed in subsequent patches. Direct3D 8 was replaced by Direct3D 9 in x86-64 version. 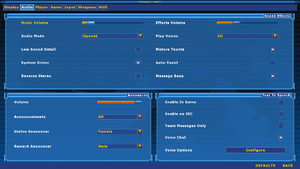 1 Cannot be selected via in-game options on Windows x86 version. See Enable the OpenGL renderer. x86-64 Windows version provides native support via in-game options. Default API on OS X and Linux. Software rasterizer was removed in x86-64 version. Included with OS X and Linux. For Windows, it must be downloaded separately. See Patches. Add ; to the beginning of RenderDevice=D3DDrv.D3DRenderDevice (For software mode, modify RenderDevice=PixoDrv.PixoRenderDevice instead). The latest Linux patch for the game contains the main files of the game to make it work properly, however it lacks some of the libraries and you may need to add a cd key. Enable Steam Play to view CD Key. The CD Keys are located in Windows registry and since Wine can simulate it, you can run with the command wine regedit or just simply regedit for your default Wineprefix. In your Steam library make sure that you can view all the games you own regardless of the system and install Unreal Tournament 2004, once finished just run it. Go to the Steamapps directory and copy all the files into your desired directory. In the System folder create an empty file called cdkey, open it in a text editor and paste in the cd key you've found. Download the installer. unpack it using innoextract and then run it. Copy all the content from the apps folder into your desired location. Alternatively you can go for an easy route and use this script to install the native version of the game. Be sure to run it through terminal. It automatically prepares necessary stuff, getting the cd key automatically and include SDLCL for fixing most of the issues that were present in original SDL 1.2.
c) Compiling OpenAL Soft library. Option A may be more simple to do as it's aleady installed, but if you are on a Fixed release Linux distro it may be behind the features. Unpack the archive and depending on the system, move or copy the libopenal.so file from libraries folder into the System folder as openal.so. Go to the main page and download the source code, either the archive or through Git. Open the downloaded folder (extract it 1st if you've downloaded the Tar-Bz archive). If everything is done, rename the created libopenal.so, as openal.so and then move it to the System folder. ut2004-bin-linux-amd64 - If you're on 64 bit system. There is no Linux version of the Unreal Editor. However, there is a native version of the UCC. To run that, run ucc-bin (or ucc-bin-linux-amd64 for 64-bit) in the System/ folder. Red Orchestra This mod became a stand-alone game. ↑ 2.0 2.1 File/folder structure within this directory reflects the path(s) listed for Windows and/or Steam game data (use Wine regedit to access Windows registry paths). Games with Steam Cloud support may store data in ~/.steam/steam/userdata/<user-id>/13230/ in addition to or instead of this directory. The app ID (13230) may differ in some cases. Treat backslashes as forward slashes. See the glossary page for details.